Our recent trip to South Florida gave me the opportunity to find new bead stores. One that I loved was in Key West called Beads of Distinction. I spent a lovely hour browsing through the beads and chatting with the proprietor. My purchases as well as found objects like shells, coral stones, and beach glass allowed me to make jewelry while on vacation. I call those pieces Crafted in Paradise. Here you can see a necklace made from a piece of frosted white beach glass caged in a net of fine gauge sterling silver wire. It showcases a seahorse in the net. It is presented on thick wrapped cording to represent marine rope. The earrings are made using the beads found at Beads of Distinction. 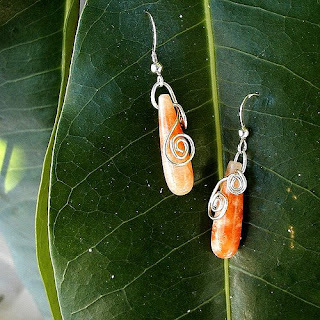 The black stick coral and fossilized orange coral drops are wrapped in sterling silver to represent the sea grass that they once called home. The mother of pearl was simply set as nothing can compete with it's translucent glow. The photographs were taken in the lushly tropical pool garden of our Bed and Breakfast La Pensione. The concierge and housekeepers were delighted to see what we were doing . Mom, as I said before, I think those pictures came out beautifully! I think that you should do more of that once your gardens are in full bloom! The Big Brother Harrassment Has Begun.